An unforgettable debut of linked stories that follow the members and retinue of a wealthy Mexican family forced into exile after the patriarch is kidnapped. On an unremarkable night, José Victoriano Arteaga—the head of a thriving Mexico City family—vanishes on his way home from work. The Arteagas find few answers; the full truth of what happened to Arteaga is lost to the shadows of Mexico’s vast and desperate underworld, a place of rampant violence and kidnappings, and government corruption. But soon packages arrive to the family house, offering horrifying clues. Fear, guilt, and the prospect of financial ruination fracture the once-proud family and scatter them across the globe, yet delicate threads still hold them together: in a swimming pool in Palo Alto, Arteaga’s young grandson struggles to make sense of the grief that has hobbled his family; in Mexico City, Arteaga’s mistress alternates between rage and heartbreak as she waits, in growing panic, for her lover’s return; in Austin, the Arteagas’ housekeeper tries to piece together a second life in an alienating and demeaning new land; in Madrid, Arteaga’s son takes his ailing dog through the hot and unforgiving streets, in search of his father’s ghost. Multiple award-winning author Antonio Ruiz-Camacho offers an exquisite and intimate evocation of the loneliness, love, hope, and fear that can bind a family even as unspeakable violence tears it apart. “A straight-on jab to the soul” (Ben Fountain, author of Billy Lynn’s Long Halftime Walk), Barefoot Dogs is a heartfelt elegy to the stolen innocence of every family struck by tragedy. This is urgent and vital fiction. Antonio Ruiz-Camacho has worked as a journalist in Mexico, Europe, and the United States. A 2009 John S. Knight Fellow at Stanford University and a 2014 Dobie Paisano Fellow in Fiction, Ruiz-Camacho earned his MFA from the New Writers Project at the University of Texas at Austin. He is from Toluca, Mexico, and lives in Austin, Texas, with his family. 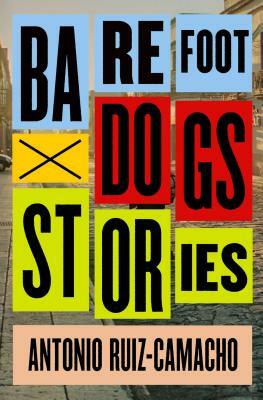 "Barefoot Dogs is a splendid collection. Each of these stories is a straight-on jab to the soul, the kind of sharp fictional punch that wakes us up to our own flawed, fragile, essential humanity. With this debut collection, Antonio Ruiz-Camacho shows he's already a writer of the first rank, one of those rare storytellers who leaves you wanting more even as he breaks your heart." "Antonio Ruiz-Camacho has written a marvelous and moving story collection: Barefoot Dogs is a brilliant and devastating portrait of a scattered, entitled, and traumatized Mexican upper-class, waking up in horror to the reality of the country they once owned. A tour de force." “'Are you afraid of a human’s touch? Have you become that American already?' one of Antonio Ruiz-Camacho’s displaced upper-class Mexican characters asks another who is about to become her lover in the Austin, Texas laundromat where they meet. The brilliantly gifted Ruiz-Camacho, writing in English about the members of a Mexican family forced to flee their country, brings the terror, sadness, tenderness and intimacy as well as the class absurdities of contemporary Mexican life into that most traditional of American forms, the realist short story. Ruiz-Camacho’s mastery will impress and astonish, open your eyes, but most of all, each one of these stories will unforgettably touch your heart and move you." "Barefoot Dogs offers readers a relatable experience of dealing with unexpected tragedy, even when framed by a less-than-relatable situation. An extremely promising debut."